Choosing a bank can seem like a confusing and daunting task, especially if it’s always seemed like there was no choice at all. Many people have accounts at the banks they do because that’s just the way it’s always been. But the truth is, you do have a choice. If you aren’t happy with your current bank and feel like you’re treated inconsiderately on a regular basis, you can make a change and choose a bank that is better suited to you and your needs. Many would be surprised to realize how much big banks don’t have it all together — and how much they rely on and take advantage of their account holders to make up for that fact. A company’s customer service says a lot about how they manage their business. If they don’t seem interested in your needs off the bat, chances are they won’t give you the attention you deserve down the line. Look into possible scenarios: what would happen if you were to become a victim of fraud: would the bank replenish your funds, and if so, how quickly? Would the responsibility fall on you or would they take the proper actions to make sure you were taken care of? Does the bank offer online banking services? How many locations do they have for in-person deposits? With online banking and phone deposits, you could avoid stepping into an actual bank for years if you wanted to. Even so, do you feel secure in whether or not your bank will be there if you need it? Does the bank clear deposits first, or transactions and deductions first? How long does it take for the bank to acquire money from your employer’s bank? How long does it take for transactions to post in your online banking app? These are important things to consider when tracking your funds and avoiding overdraft fees. Most banks instill monthly maintenance fees on their account holders, usually around $10-$12 a month. If this doesn’t pose a problem for you financially, then that’s great. There are free checking options out there. Most banks charge account holders overdraft fees in the event that the account holder spends more than what is in their account. This is where problems begin: you’ll be charged an initial $35 for the overdraft, and another $35 for every other transaction that clears after the initial overdraft. That’s the case even if you made those purchases before the one that put you in the overdraft zone. This is where banks can take advantage and customers end up in poor situations. One final thing to consider in choosing a bank: it doesn’t have to be a bank at all. Because credit unions exist. Big banks operate on a top-to-bottom model, whereas most credit unions operate on an even lineage where account holders are the members. 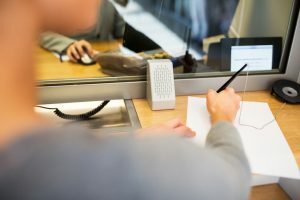 While credit unions may not impose the same overdraft fees as banks, many will still charge you a one-time fine, and then keep your checking account at zero rather than falling into the negative. And despite the common conception that credit unions are outdated and inconvenient, they offer online banking just like any other bank, and credit union members are able to utilize any credit union with which their home location is affiliated. Ultimately, whether you choose a bank or credit union, you need a financial institution that is right for you, and both banks and credit unions have their advantages. If you don’t know how to choose a bank or credit union, take these things into consideration. The bank you hold an account with is a major facet in your daily security and means of living, so it is an important decision worth making in what fits you — not where you fit. While CreditGUARD doesn’t counsel its clients on which bank they should choose, we can counsel you on your debt problems. Our certified credit counselors can help you better understand your financial situation, your options and how CreditGUARD could save you money! Call CreditGUARD Today!